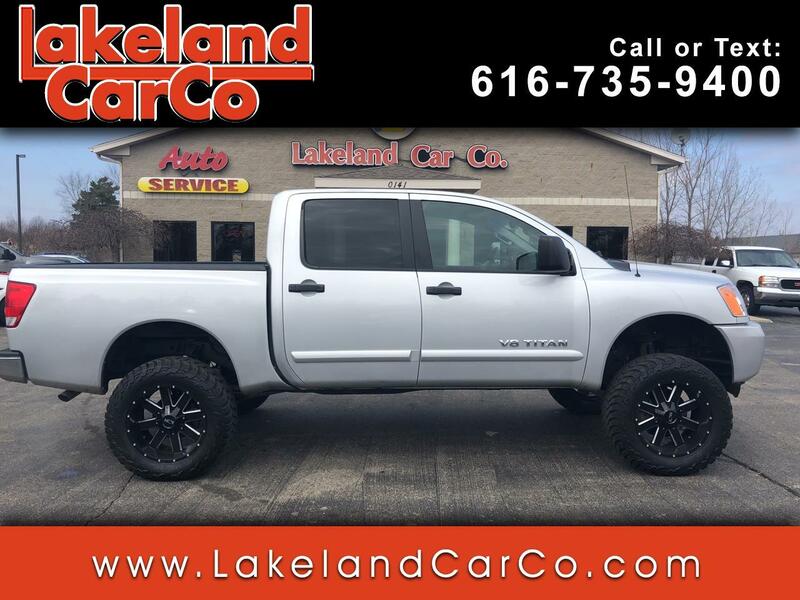 Used 2015 Nissan Titan 4WD Crew Cab SWB SV for Sale in Grand Rapids MI 49534 Lakeland Car Co.
Sculpted in beautiful Galaxy Black, our 2015 Nissan Titan SV Crew Cab 4X4 boasts all the power and style you desire! Powered by a massive 5.6 Liter Endurance V8 that offers 317hp while paired with a durable 5 Speed Automatic transmission for amazing passing ability. This Four Wheel Drive offers near 19mpg along with colossal towing and payload capability! The bold exterior of our SV is highlighted by 18-inch aluminum-alloy wheels as well as a chrome grille and bumpers. Step inside our SV, see the innovative interior uses every inch to maximize space for your passengers, cargo, or just about anything you need! You'll appreciate remote keyless entry, cruise control, two dash-mounted 12-volt DC power outlets, rear reading lights, and 8 beverage holders. To make the workday more pleasant, listen to your favorite tunes with the AM/FM/CD audio system which features an auxiliary audio input jack and 8 speakers. Nissan's Safety Shield will keep you and your passengers out of harm's way with 6 airbags, vehicle dynamic control, a traction control system, a tire pressure monitoring system and much more. We know you work hard for a living, so now is the time to reward yourself with a truck that works even harder! Print this page and call us Now... We Know You Will Enjoy Your Test Drive Towards Ownership!